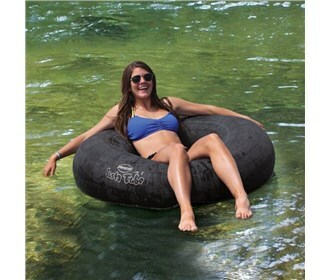 The SportsStuff 52-1140 JUSTA TUBE is a 40 Inch hypoallergenic black donut tube. The schrader valve stem is shorter than a standard auto valve and has a tapered cap, so there’s no discomfort or scratching legs. It is made of isobutylene isoprene synthetic rubber which is an upgrade from a standard tire tube. The tube has more resistant to heat, abrasion, ozone and sunlight. JUSTA TUBE provides year round fun and is easy to store. It is a durable snow tube in winter and in summer, enjoy it as a durable river, lake, pool or ocean float. The Sportsstuff Justa Tube - 40 In has many exciting features for users of all types. See the Sportsstuff Justa Tube - 40 In gallery images above for more product views. The Sportsstuff Justa Tube - 40 In is sold as a Brand New Unopened Item.